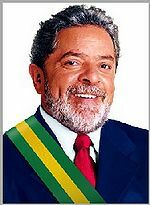 Luiz Inácio Lula da Silva (Garanhuns, Pernambuco State, born 1945) is a socialist politician who was the 35th President of Brazil. He was succeeded by Dilma Rousseff on January 1, 2011. In 1980, he founded with a group of leaders the Partido dos Trabalhadores (PT) or Workers' Party, a left-wing party. Lula ran for President of Brazil three times unsuccessfully. During his first term, Lula da Silva oversaw a growing economy and a reduction in the poverty rate. Lula is referred by some critics as uneducated, ignorant, arrogant, insane and a representative of poor Brazilians. His political persona is seen as authoritarian, extravagant, and impulsive. Despite having no education, it is said that Lula is driven by a group Stalinist of the Worker's Party. Friend of Hugo Chavez, Fidel Castro and Mahmoud Ahmadinejad, he is regarded as working around the intense polarization between left and right; "Lula's heart may beat to the left, but his head tells him foreign investment is essential for Brazil to grow," noted Steve Kingstone of the BBC. In 2016, when he was accused of bribery, he claimed that there was nobody in Brazil more honest than him. Lula has been labeled by those involved in "Petrolão" (the corruption scandal of Petrobras) as "chefe da quadrilha" (head of the gang of thieves). In 2017, Lula was sentenced to nine years in jail by Sérgio Moro, based on the accusation of receiving and hiding an apartment as bribe. He wasn't arrested, since, by Brazilian law, he can appeal in liberty. On 2018-01-24, TRF-4 (Tribunal Regional Federal 4, Brazilian's court of appeal) confirmed by unanimous decision all accusations against Lula, and raised his period to 12 years and one month. He continued to appeal the ruling. In February 2019, Lula's sentence was expanded after he received a separate 13-year sentence. ↑ In Portuguese: "Não existe viva alma mais honesta do que eu"
↑ Martel, Frances (February 9, 2019). Brazil Sentences Socialist Ex-President Lula to Another 13 Years in Prison, Bringing Total to 25. Breitbart News. Retrieved February 9, 2019.